The new electric AGA eR3 90-3 offers everyday control and boasts a host of useful features, including a patented hotplate, fast heat-up times, a defrost function, an optional timer and higher temperatures and better performance than many other range cookers on the market. Great attention has been paid to even the smallest of details, such as the stylish and branded handrail, ensuring this is a cooker that is built for life. 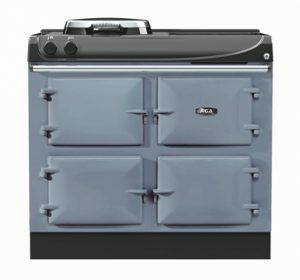 The AGA eR3 offers improved premium aesthetics that AGA, as a luxury brand, is renowned for without drastically changing the appearance. 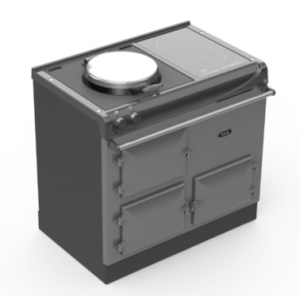 The AGA eR3 provides a larger capacity than the AGA 60 and offers technological improvements that will appeal to a wider, younger audience as well as the current AGA customer. 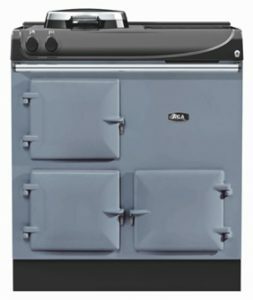 This new AGA ‘everyday’ cooker will enable our customers to have a fully flexible and controllable AGA cooker, with low running costs and no requirement for regular servicing; all at highly competitive retail price. AGA ‘everyday’ is about practical solutions that meet normal life’s daily challenges. Ready to go in an instant or more flexible when you have the time. 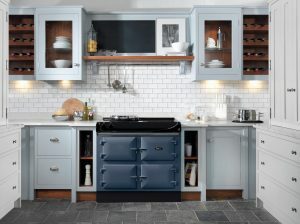 The AGA defining aesthetics have been retained to ensure continuity of the AGA cooker’s unique style. The AGA eR3 model has a patented hotplate that can be set to either simmering or boiling mode, an oven that can be set for roasting or baking, a simmering oven and a useful warming oven. Plus, you can choose between warming plate or a state-of-the-art two-zone induction hob – complete with bridging feature, allowing you to use a griddle plate, fish kettle or other large cookware. There is also the 100-4 model, which offers a handy additional built-in storage space for roasting tins, baking sheets and other cookware. The new AGA eR3 offers everyday control and boasts a host of useful features, including a patented hotplate, fast heat-up times, a defrost function, an optional timer and higher temperatures and better performance than many other range cookers on the market. Great attention has been paid to even the smallest of details, such as the stylish and branded handrail, ensuring this is a cooker that is built for life. As with the AGA 60, each model features an AGA hotplate which can be set to simmering or boiling and has resting areas surrounding it. This new AGA induction hotplate features a 2- zone large pan area suitable for two pans, or an induction suitable griddle or fish kettle. As with the AGA 60 this cooker has two cast iron ovens located on the left hand side and controlled by rotary control as found on the AGA 60 as well an additional option of a programmer/timer device for the top oven. 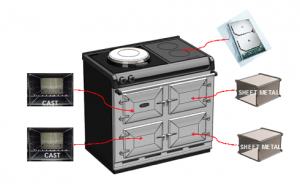 The two right hand cavities are steel, the warming oven is heated by an element and is turned on using a separate switch on the top right of the appliance. The Complete AGA Cookbook by Mary Berry & Lucy Young.